I've almost finished my sock yarn blanket and I enjoyed the project so much that I'm planning to make another. This one will be different than the first. For the first one, any and all sock yarns were added and I am keeping the blanket. This time I'm making the afghan in as many pinks as I can collect. I'm going to be a grandma again around the end of October and it's a girl and this blanket will be for her. 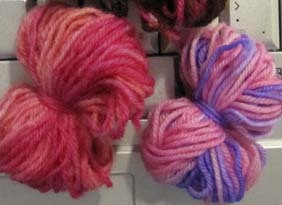 I have a couple of bits of leftover sock yarn in order to get started but I'm going to need many, many more. I know that I have more colors in my stash so I'm going to to through it. Now, an appeal. If you have any sock yarn that is more pink that any other color and you wouldn't mind parting with a little bit of it, would you send to me to add to the afghan? I need only a length of 8 yards for each block. If you had even one length that you could pop into an envelope it would be much appreciated. Every bit helps. If you send me an email at: joanne @ jconklin . com (remove the spaces), I'll give you my mailing address.